We flew up to Uist on the outer Hebrides yesterday. We started off at Birmingham airport where we saw Ashley Giles (England spin bowler for those of you who don't know your cricket). 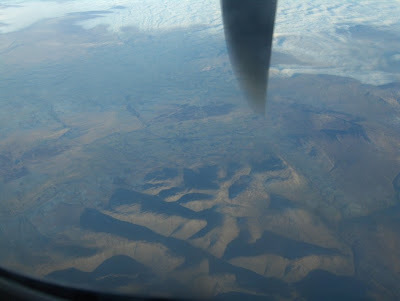 We flew from Birmingham to Glasgow and then from Glasgow to Benbecula (the island above Uist). I have never been on an internal flight before and the smallest plan I have been on is a Boeing 737. The first plane on the right was pretty small until we boarded the plane at Glasgow (a SAAB 340) which pretty much was a car with wings! It had 32 seats. Having Scottish attendants on the plane reminded me of The High Life hence the post title. Does anyone else remember it or am I on my own? 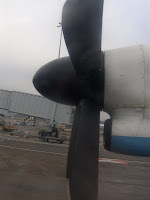 Despite being cosy on the planes, I grabbed a window seat for the flight to Glasgow and although I was worried at first that I would not be able to see much as we were next to the propeller and it was very cloudy, I managed to grab some great pictures as we flew over what was either Northumberland or South Scotland. 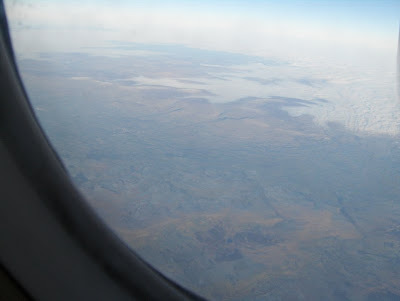 Unfortunately because of the cloud it was difficult to gauge where we were. I remember Air Scotia! Oh Deary Me!